Sleeve notes in English and sung text with English translation. Susan Bickley is one of the most accomplished mezzo-sopranos of her generation, with a wide repertory encompassing the Baroque, the great 19th and 20th century dramatic roles, as well as contemporary repertoire. In May 2011 she received the prestigious Singer Award at the Royal Philharmonic Society Awards, the highest recognition for live classical music in the UK. The London Sinfonietta is one of the world’s leading contemporary music ensembles. Formed in 1968, the commitment to making new music has seen the orchestra commission over 400 works and premiere many hundreds more. Resident at Southbank Centre and Artistic Associate at Kings Place, with a busy touring schedule across the UK and abroad, the London Sinfonietta’s core eighteen Principal Players are some of the finest musicians in the world. The BBC Symphony Orchestra has been at the heart of British musical life since it was founded in 1930. It provides the backbone of the BBC Proms, performing around a dozen concerts at the festival each year. The BBC SO has a strong commitment to 20th century and contemporary music. Its 2017–18 season includes Sakari Oramo’s Sibelius symphony series, Total Immersion composer days devoted to Esa-Pekka Salonen, Julian Anderson and Leonard Bernstein, a concert staging of Jake Heggie’s opera Dead Man Walking and an evening with American writer Armistead Maupin. It regularly performs with the BBC Symphony Chorus and together they won the 2015 Gramophone Best Choral Disc Award for their recording of Elgar’s The Dream of Gerontius. One of the most influential composer-conductors of his generation, Oliver Knussen was born in Glasgow in 1952 and grew up near London (where his father was principal Double Bass of the London Symphony Orchestra), later moving to Suffolk where he lived for the remainder of his life. The recipient of many honours and awards, including the Nemmers Prize in 2006 and the Royal Philharmonic Society Conductor Award in 2009, he served as Artistic Director of the Aldeburgh Festival (1983–98), Head of Contemporary Music at the Tanglewood Music Center (1986–93), Principal Guest Conductor of the Hague Residentie Orchestra (1993–97), Music Director of the London Sinfonietta (1998–2002), Artist-in-Association with the BBC Symphony Orchestra (2009–14) and with the Birmingham Contemporary Music Group (2006–18), and Richard Rodney Bennett Professor at the Royal Academy of Music (2014–18). He was appointed CBE in 1994 and received the Queen’s Medal for Music 2015. Together with Colin Matthews he founded the Composition and Performance courses at the Britten-Pears School in 1992. In recent years he was invited for residencies at the Royal Academy of Music, the Eastman School of Music, New England Conservatory, and the Library of Congress in Washington DC. His 60th birthday was celebrated with special events in Aldeburgh, Amsterdam, Birmingham, London and Tanglewood, and in 2016 his work was the subject of a retrospective Composer Festival given by the Royal Stockholm Philharmonic Orchestra. 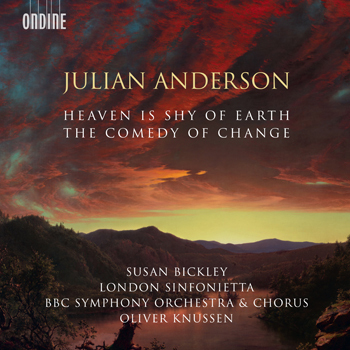 His recording of Carter’s Late Works (ODE 1296-2), released in August 2017, received BBC Music Magazine Special Jury Award and was nominated for Gramophone Awards in the Orchestral category.